We haven’t had much time for curb shopping lately, but sometimes the curb piles just find you. That was certainly the case last week, when we cut through a neighborhood to avoid traffic, and came across a huge pile of landscaping rock. It was too much to load into our car, so we ran home for the trailer, and crossed our fingers that it would still be there when we got back. The homeowners came home while we were loading it, so we even got to thank them. It looked like they’d taken up a small pond because there was part of a pond liner in the pile, too. 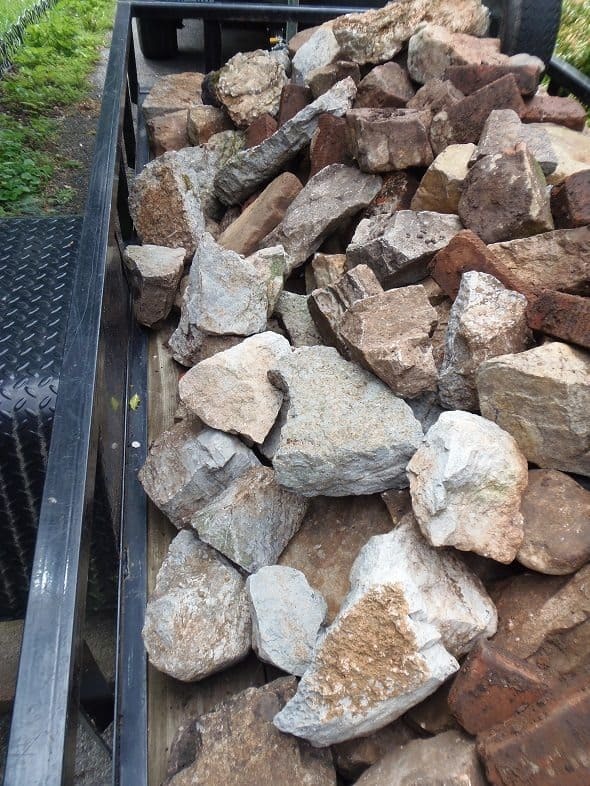 Their neighbor also had a pile of rock out at the curb, so we loaded that while we were at it. There were even some old bricks in that pile. We estimate that it’s about two and a quarter tons of rock! Safe to say we got our exercise loading and unloading it. I plan to use some of rock to finish edging my herb garden. I’m not sure what we’ll do with the rest yet. We were given a pond liner a while back, so maybe we’ll put in a small pond. My husband says he sees people giving koi away on Craigslist from time to time. 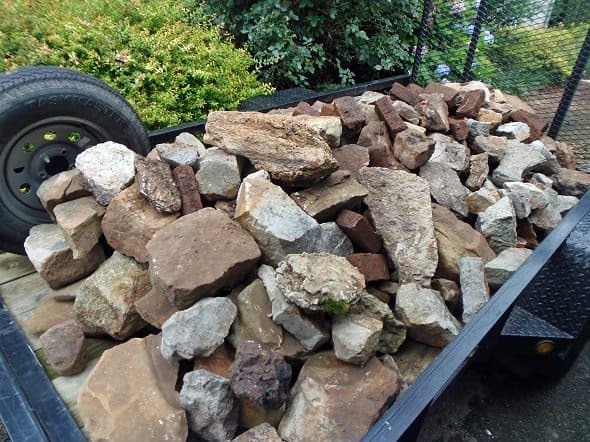 Have you found anything good in a curb pile lately? I’d love to hear about it. Erin you can raise goldfish in these ponds. My friend has had the same fish for years now and some resemble Koi in size. We are located in N. Ga so our temps are very similar. During the winter months the fish stay in the lower levels of the pond. She does provide some summer pond plants and has a few cinder blocks painted black on the bottom as shelter. A small piece of netting that sits over the pond has kept the predators out and is only noticeable when standing beside the pond.